We hear on a daily basis about how important social networks are, either social or professional. I have to agree, they are extremely important, however, not all of us are actually good at actively engaging in expanding their personal networks. I’m personally terrible at it, although I think this may be a problem for me going forward the next few years. I plan on getting into science and technology policy, if it wasn’t pretty clear based on my writings here. So, having a broad network is important. I will need to keep up with technological, scientific and political advances (although in the US regressions may be more apt). I just finished reading The New Argonauts by AnnaLee Saxenian, which really pointed out the power of networks. It’s a pretty rosy interpretation of the benefits of networking for Taiwanese, Chinese and Indian entrepreneurs that had decided to move back home after working in Silicon Valley. It’s a much better representation than Thomas Freedman’s World is flat, which is just ridiculously overly the top optimistic. There are a lot of theories about how networks operate and what type of network you want to have. What do you mean type of network? Well, I’m sure you can think of different types of networks that you have. You have close friends that you are around all the time, and then you have co-workers that you interact with in a different manner. Some of them you let into your social network, others you keep within you professional network. Now within those networks they could be structured very differently. At work you could have a lot of contacts in many departments and interact with them to get the best information about how to get a job done or that person is your go to for getting stuff done for you. This was how my network was at when I worked at SAS. I had to have many contacts in different departments. This was different from some of my colleagues who only worked within a department and didn’t have much external exposure. You would have to make an effort to change your network type. As I mentioned above networking is good for information. This is also the case in the scientific community. Saxenian focuses on technological knowledge flows in her book. 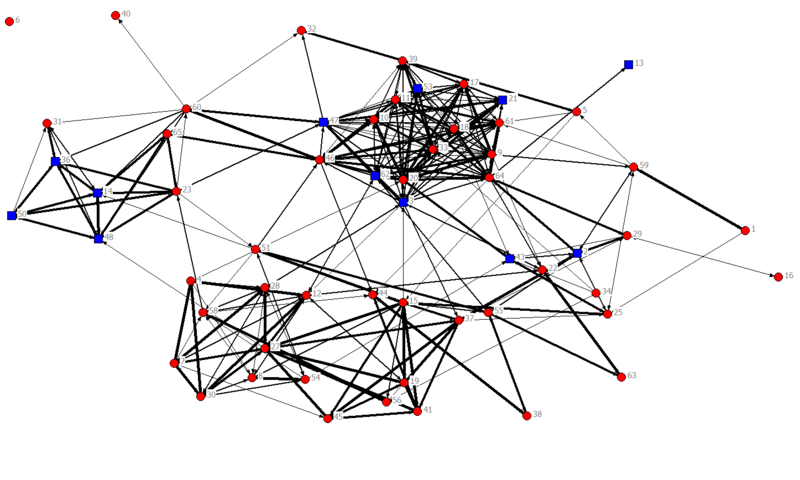 She looks at the locations of firms and how they interact with both halves of their network. Two halves? Yep, one in Taiwan and one in Silicon Valley. These Argonauts were bridges between the two regions. This has allowed Taiwan to become a leader in computing because of this. You are also able to use social networks to identify people. This was an assignment for one of my classes, which had three different class codes. We were given our class network data, from a survey, and we had to attempt to reconstruct our class networks. As you can see below there was some clustering going on, with some people acting as bridges from one part of the network to the next. The points that bridge the networks are good points for knowledge to flow from one part to the next. These are the people that are always good to have contact with. This entry was posted in Innovation, Science and tagged Knowledge, Networking, Science. Bookmark the permalink.